Description: NS SD60 6595 handling some switching chores in the old Southern Railway yard at Columbus, Ga. Description: NS SD60 6595 in the NS yard at Columbus, Ga. Description: NS M67 with NS 6595-NS 6585-UP 5560-NS 2535 bang across the UP/NS Diamond. Description: NS 128 with it's usual array of Junk units passes 11R at Aycock. Description: NS 21M by Phillipsburg @ 0942 hrs. Description: Ex-SOU SD60 leads a slab train out of S. Philly. Date approx. Description: First photo in a long time-yes, I'm back. NS 214 heads for it's destination in north Jersey on the Port Reading Secondary. 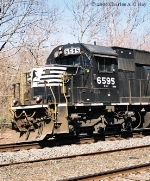 The consist contains an SD60, 2 GP60s, and a B32-8! Description: NS 214 pops out of the East portal of Musconetcong Tunnel in Pattenburg, NJ on April 29, 2006, at first light. This train was a local favorite for its usual assortment of older non-wide nose power. Description: NS stacktrain 214 rolls east through Bound Brook onto the Port Reading Secondary, taking the back way to Croxton on a beautiful morning. Description: An SD60 and two catfish lead 173 south through Kannapolis during a rain shower and undoubtedly a relief from the hot sun for the crew. Description: NS 304 heads past the "Miniplant" crossing on it's way to Columbus.